A long time ago, I have reported on my blog about the hostile red and blue knights. The fight went back and forth. It was not that all the red and blue knights were united. It was the only one of her belonging to a color. At the beginning of the year a purple knight appeared on the battlefield. The red and blue knights hoped that the purple knight would join them and thus decide in the battle. The purple knight, however, did not want to choose one of the two sides. He convinces the red and blue knights to tackle the next challenges together with him, because all knights are needed together. How this story continues, we will pursue. Will all the red and blue knights follow the purple knight or will one or the other refuse followers and stand against the community? With the BIM process, we consider and accompany the entire lifecycle of a building, construction or infrastructure from development, planning, creation, use to demolition. The phase of utilization and maintenance is by far the longest phase by far. During the BIM process, we create three-dimensional models which are continuously maintained and updated as part of the process. With the CAFM processes, we consider the sum of all buildings, structures and infrastructures of a company, a municipality or a country. The desire for renewal, expansion or change is the initial spark for a new BIM process. The focus of the CAFM processes is the maintenance and rapid elimination of faults. The elimination of defects from the creation phase does not belong to this. 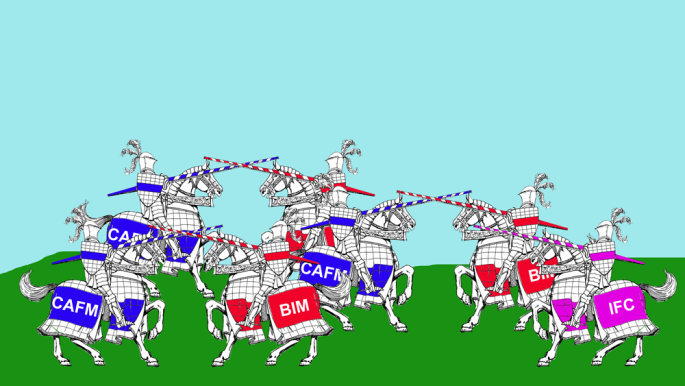 While the graphical models are a high priority in the planning and creation phase, the graphical models in the CAFM are only a means to the purpose to implement the CAFM processes more quickly and precisely. Read the full article in the BIM Lean Construction website.